Tweet a photo of your Bike & Ride May 12–31, 2014, and include the hashtag #mydartride. You may enter as many times as you would like during the sweepstakes period. Winners will be selected at random and notified via Twitter direct message. For complete contest rules, please click here. Posted on May 1, 2014 by Tony F.
This month is Bike Month in Des Moines and DART is a cyclist’s friend. All DART buses are equipped with bike racks, making it convenient for you to bike & ride around the city. In 2013, DART carried 52,418 bicycles, which shows that taking the bus is the perfect way to get to your bicycling destination, or your relaxing way back after a great ride. DART Central Station is Downtown Des Moines’ premier intermodal facility with public bike racks available along the north sidewalk of the station fronting 6th Avenue. Also, at the corner of 6th Avenue & Cherry Street is the DART Central Station B-Cycle Station, the bike-sharing system in Downtown Des Moines. 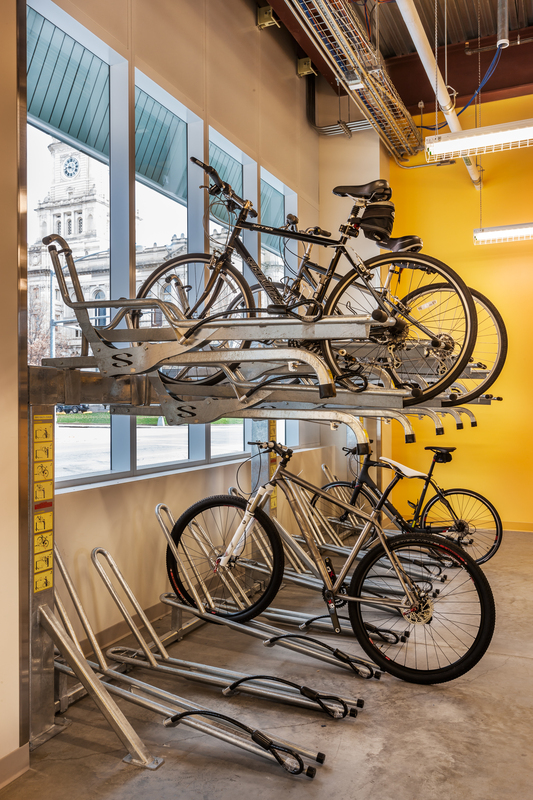 If you’re looking for a way to store your bike out of the elements, reserve a spot in the bike storage room at DART Central Station. Members have card access to secure bicycle storage and changing rooms. Become a member for $50 a year with a one-time refundable $50 deposit for the access card. The bike storage facility is accessible Monday – Friday from 6 a.m. to 11 p.m., Saturday from 6 a.m. to 10 p.m. and Sunday from 7 a.m. to 6 p.m. Some impressive stats for you today from Des Moines B-cycle, only the fifth bicycle-sharing program in the country when it launched September 1. Our B-cycle program caught the eyes of many. From San Francisco and Seattle to Greenville and Boston, we filed calls from a variety of communities seeking our start-up advice. I can’t tell you how pleasing it was to share insights with Seattle, which will spend more money on consultants than we invested in a pilot program. In Des Moines, we just did it. We have learned and adapted and are now ready to expand. 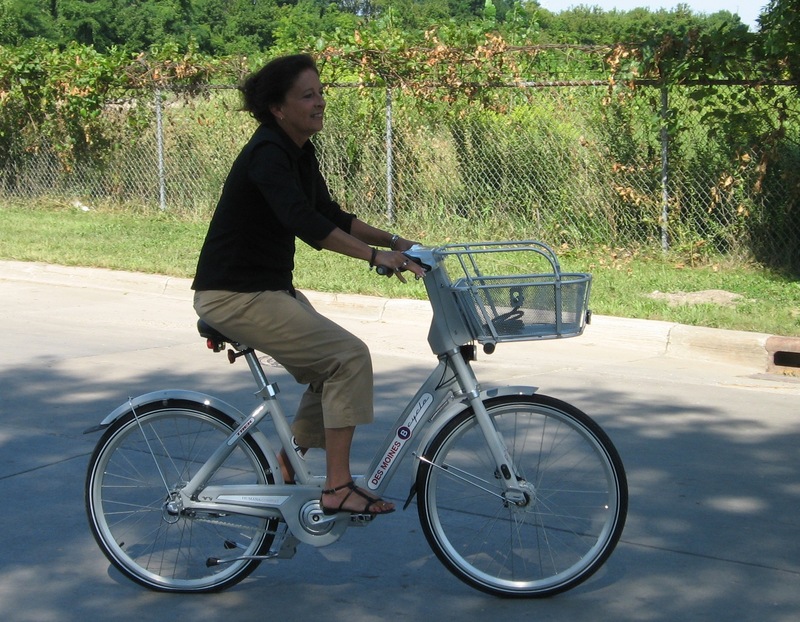 When spring rolls around, we’d like to see 100 bikes and 10 or more kiosks — a real network — in downtown Des Moines. And yes, we’ve already fielded inquiries about a satellite network in West Des Moines. DART has already committed to locating a B-cycle kiosk at the new Transit Hub when it opens in late 2012.